This dairy-free pear custard is a great way to use fresh ripe pears when they all become ripe at once. This custard can pass for dessert and then breakfast the next day. 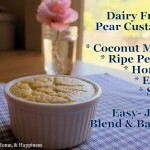 It is such a wonderful nourishing dairy free meal/dessert I know you’ll love it! Fill 1 or two 9x13 inch glass dishes with 1 inch of water for the water bath. Place in the oven and preheat oven to 350*. Mix all ingredients in a blender or food processor to a smooth puree. Fill custard cups (or ovenproof cups such as mason jars) half full with custard mixture. Once the oven has preheated, gently set the cups in the water. Bake in the water bath for 30-45 minutes or until custard is mostly set but still soft in the center. Remove carefully with oven mitts or crack the oven door and allow to cool in the oven, removing when cool. Serve warm, or cover with plastic wrap to store in the fridge and serve cool. Sounds delicious! I’ve got everything on hand to try this out tonight. Two questions: Do I grease the jars before filling them? Did you peal the pears? Thanks! My daughter absolutely loves pears. And I love custard…so I can’t wait to make this recipe! 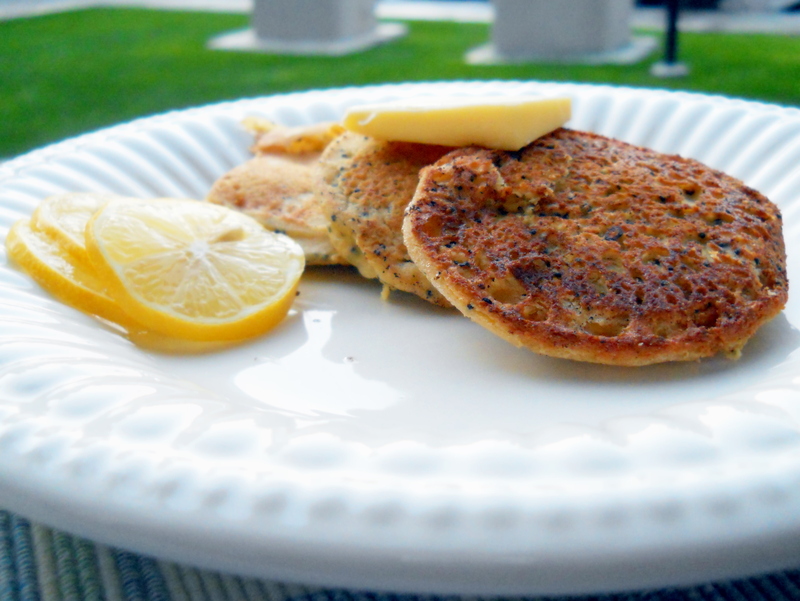 This recipe was in the GF meal plan last month and it has been a huge hit! I’ve made it twice and then used the base for several variations. I did serve this to a couple of kids who had never eaten custard before (most of the food they have had is Standard American Diet stuff) and they weren’t huge fans, but my boys happily finished it off for them. This was easy and delicious! However, mine seemed to have 2 layers – one at the bottom that was nice and creamy and the top one was fluffier (more like scrambled eggs) . Any idea on where I went wrong or if this is the way it’s supposed to come out? 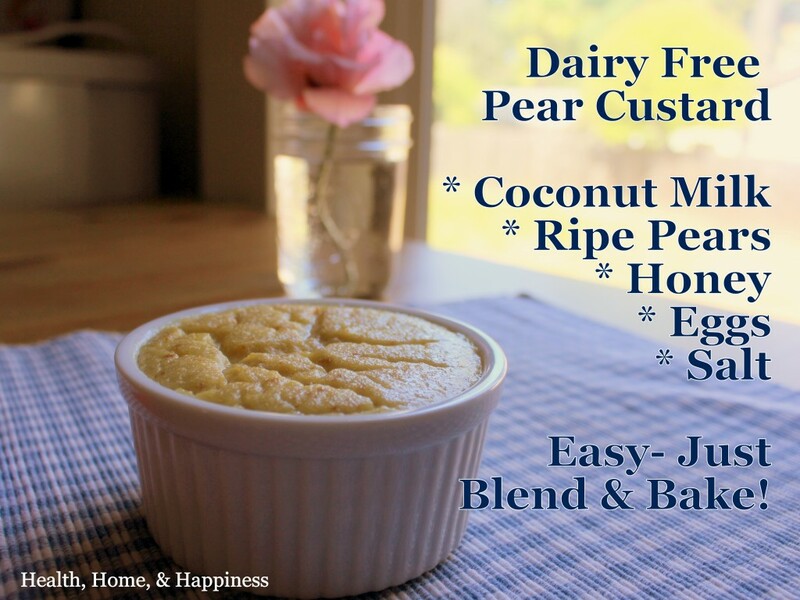 This looks so good :-) Is canned coconut milk GAPS legal? I usually use Thai Kitchen organic and I think it has guar gum in it. It this ok? It would make life a lot easier! Also, I have a question about your e-book What Can I Eat Now. You refer to broth and I noticed in the FAQ on the gaps site that meat stock and bone broth are not used interchangeably but are different things with different nutrients and both should be used. Do you use both? It seems like you are using bone broth because she says meat stock is only cooked 2-3 hours. One more thing :-) Your recipe for sauerkraut has it fermenting 3 days on the counter, this is how long I have typically left it as well. But in the FAQ she says that it should ferment 2-3 weeks, until all bubbles and gasses have stopped and the food will not rot if left on the counter or in the fridge even if dry. Basically until the entire process is complete. What do you think about this? We are getting started at the end of the month and I am trying to learn all I can. I just made this ( added fresh vanilla bean too) and it was very easy and delish, however Im not in love with the grainy texture the pears give this. I think they lend a delicate flavor though, so next time I might just add some pear extract that we made.. but when we want the added nutrition of fruit, our next try will be with mango or banana. I agree with your comment about the grainy texture. I like uncooked pears and plain cooked pears. But when added to recipes, they wind up making it grainy. I went ahead and tried this anyhow, but it definitely had the grainy pear texture. Would probably not make this again with pear, but would try with other fruit. This is perfect for me as I cannot eat dairy and love pears. This looks yummy! Hopefully I’ll be able to introduce coconut milk soon. In the meantime, do you think using cultured dairy would work in its place? Silly me, I should read a bit more carefully – just saw the cultured dairy alternative. Apologies – must be brain-fog from die-off ;)! where do you get ur cocnut milk from? the one i bought from wilderness family naturals contains xantham gum which is def illegal on Gaps & SCD. it gives my son diarrhea. the recipe sounds delish. Fairly new to your blog and looking for SCD recipes. This pear custard was warm & comforting, slightly sweet, but not overly so. Everyone loved it! Thanks so much for sharing! This sounds yummy and I’m thinking about making this for my husband and myself. If I divided all of the ingredients in half, so we wouldn’t have many leftovers, would that be OK? This looks super yummy! I do not have custard cups or mason jars the right size. Can I use a casserole dish and bake it without the water bath? OH, great idea, thank you! Sounds like I have a plan for breakfast tomorrow! :) Thank you Cara!